Turkish Riot is an online video game in which the goal is to send as many tweets as possible before the police beat you up. It was created last summer, presumably as a lark, to mock the role of police violence in the Gezi political protests in Turkey. I’m not usually a fan of video games, but as someone living in the middle of Istanbul at the time, I thought it was hysterically funny. I’ve never made it past 17 tweets. Maybe you will do better. You can try it here. Tear gas, water cannons, rubber bullets and political intimidation take their toll on everyone, but the Gezi protesters did an amazing job of using humor to stay energized and motivated. So, how does this relate to business development? Building a business (like democratizing a country) takes time and entails substantial trial and error, delays and setbacks. It is a marathon, not a sprint. This is why keeping a sense of humor is critically important. Humor energizes us, gets us in touch with our humanity, connects us with others, and keeps us going when circumstances might otherwise feel demoralizing. If Turks can see comedy, even when fighting for the soul of their country – even as young people die, as doctors are punished for treating injured protestors, as the government shuts down Twitter and YouTube – certainly you can bring a sense of levity to your efforts to make partner, to become your firm’s next rainmaker, or to get your new law practice off the ground. For those who are interested, below are a couple more examples of how the Turks brought humor to the protests. When the Prime Minister Erdogan called the protesters “çapulcu,” (meaning looters, pillagers, plunderers) the protesters created a music video “Every day I’m Çapuling” as a play on the song title "Everyday I'm Hustlin'" by Rick Ross, thereby co-opting a previously derogatory term into a positive term of self-identification. This video went viral, and çapuling even has its own Wikipedia entry. The picture below shows a booth that was set up during the protests. 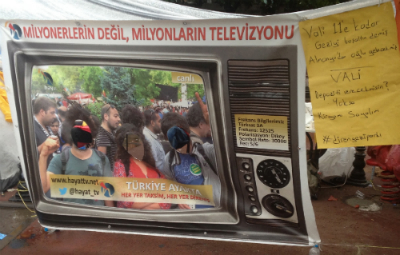 Someone enlarged a picture of a TV news program reporting on the protests, cut out the faces of the protesters, and gave passersby the opportunity to get their pictures taken posing as the protesters on the news.